We now offer two versions of the Bullet Brace in order to accommodate more trombone models. The BB2001 fits Edwards, Getzen, and most Shires trombones. However, we have not tested it on the Shires TruBore instruments. The “S” brace included with the BB2002 model provides adequate room to fit most other manufacturers’ trombones. However, some modification of the “S” brace may be required in order to fit the Bullet to your instrument. The “S” brace is built long to accommodate any such modification. See installation instructions for more details. We would like to thank everyone who provided feedback on this product. With the input Edwards received, we have made improvements to the bullet brace. The Bullet Brace is a descendant of our Stegeman bar, which has been in existence for six years. These items came into being from the requests of many players that wanted left arm relief from the many hours they were spending holding their instruments. The Stegeman bar is an “L” shaped brace that is soldered onto the receiver of the valve section. This brace helps redistribute the weight of the horn to the bigger lower muscles of the left arm. By redistributing the weight the bar takes the tension off of the smaller upper muscles in the wrist region. Many people get an imprint in the fleshy part of their left hand from the weight of their horn. The Bullet Brace and Stegeman bar eliminate these pressures and relieve discomfort that can occur from holding the instrument over a long period of time. The Bullet Brace is the most innovative stress-relieving device built since the Stegeman bar. The Stegeman bar relieved stress but required a technician to solder into place once the right position was found. If the technician was not good with a torch the heat could travel towards the receiver/valve connection and weaken the integrity of the joint. Once in place, the Stegeman bar was not adjustable and if a player ever had the slide in a different position from where the Stegeman bar was positioned, the Stegeman bar could become uncomfortable. Bullet Brace Wanting to make this bar something that every trombonist could attach to their trombone without the use of heat was one of the goals Edwards had when they set out to build the Bullet Brace. To make something that would fit every player regardless of their hand size and eliminate the most stress while improving the player’s comfort was a large challenge, to say the least. It took a few prototypes but the final design was a two-piece design that allows the player to mount the Bullet to the lower bell brace near the bell. The Bullet is mounted with the same allen wrench that works on the axial flow valve. The “S” brace fits into the bullet and can be adjusted as needed to fit the individual’s hand. The bullet can be moved left or right on the bell brace and adjusted higher or lower to move the “S” bar wherever the individual should desire. A black delrin rod is installed on the bar and can be left alone or a black piece of round foam (comes with purchase) can be fitted over the delrin rod to assure a greater comfort. The Bullet is machined out of solid aluminum, which helps maintain the sound qualities we are after with our instruments. The Bullet Brace is installed on a cross brace which does not dampen the vibrations of the instrument. Soldering onto the receiver can cause vibrations. With no heat being applied there is no worry of weakening any solder joints where the valve meets the receiver. With infinite adjusting possibilities a person does not need to go to their local repairman to tweak the position of the Bullet Brace, they just need to remember where they put their allen wrench. Congratulations on the purchase of the bullet brace. Used correctly, this brace will help redistribute the weight of your instrument to the larger muscles of your left arm. The initial setup of the bullet brace is simple; once installed you can easily adjust the "C" or "S" brace or bullet to find the perfect fit. Micro adjustments may make your final comfort level and enjoyment level higher. https://www.youtube.com/watch?v=AlYaa22t42c The bullet is to be installed on the lower bell brace, which connects to the bell, right beside the F trigger saddle. On Bach 42s you may have to mount bullet closer to bell as the distance between the trigger saddle and bell flange varies. 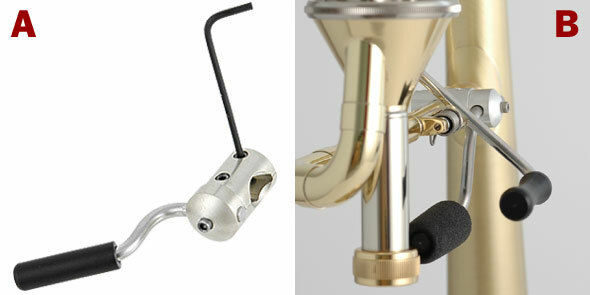 The "S" brace included on the BB2002 is a universal part that is supplied to fit most brands of trombones. This means that some slight modification may need to be done to fit your particular instrument. Do not be afraid to grind or sand down either end of the S brace to make the brace fit your instrument better. The delrin rod is only press fit onto the one end of the brace and you can remove this easily with soft jaw plyers. If you are determined to fit the bullet into a smaller area than the bullet is made for you can remove a significant amount of side material via grinder before performance is hindered. All modifications should be done with the understanding that once the item is modified it is nonreturnable. Do at your own risk. Install the Bullet on the lower bell brace (Picture B). Do not over tighten the bullet on your bell brace. Over tightening may cause damage to the lower bell brace. The Bullet should be at a 90 degree from the bell. The weight of the horn will thus hang on the bullet. Any other position may cause the bullet to rotate and slip as the leverage is then put on the bullet rather than supporting the weight through the S brace. Using the allen wrench with the long end in the screws rather than the short end will ensure you cannot over torque the bullet brace (Picture A). Be careful while putting the Bullet on not to drop the Bullet and cause damage to your bell flair. The Delrin arm at the end of the S brace will point towards the slide receiver that is below the valve. 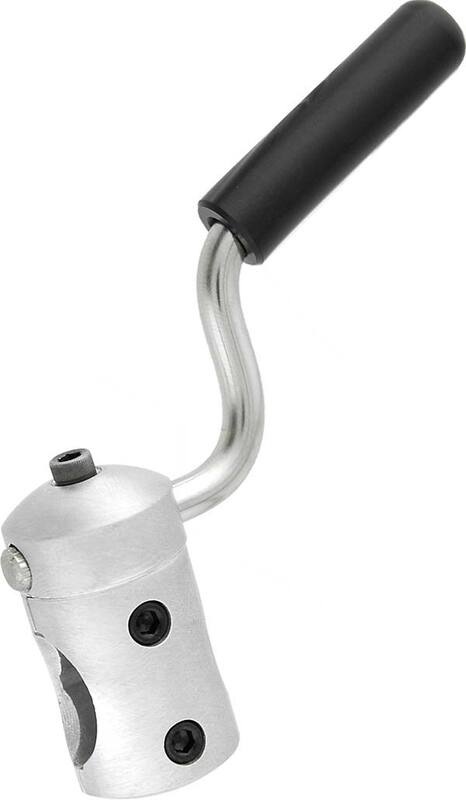 Adjustments can be made by swiveling the nickel bullet or pivoting the stainless S arm to best fit the black delrin rod in-between the thumb and forefinger of the left hand. The S arm can also be adjusted side to side to find the best fit. Remove the main tuning slide and then proceed with unscrewing the bell from the valve section. Once you have found the best position you can use the cushioned sleeve to fit over the delrin rod to add additional comfort. Cut the cushioned sleeve to your desired length.